A flipped classroom is an instructional strategy. “Flipping” a classroom entails switching up the usual model through which students encounter new knowledge. In a flipped classroom, students have required reading or lecture videos before the class meets, and then class time is used for discussions, problem-solving, or other kinds of active learning that will help them actualize and assimilate this new knowledge. To frame this model using Bloom’s revised taxonomy (2001), the “flipped” classroom has students undertake the lower levels of cognitive work (gaining knowledge) on their own beyond class time, and then has them focus on the higher levels of cognitive work (applications, analyses, evaluations, etc.) during class time, where they can take advantage of scaffolding support from peers and the instructor. Do certain class sessions already have an in-class activity planned? Is this activity one that often takes time to complete, and that requires students to apply the knowledge or skills that they’ve just learned? Does the class involve concepts that students often struggle to understand, and often need the teacher’s help with? Based on past assignment grades, which concepts are these? Step 3: Spell out the connections between the different sides of the “flipped” model: what students gain “first exposure” to before class, and then the homework-like applications that then take place during class time. What should students be understanding and learning how to do, by completing this portion of the course? How do these learning activities fit into the larger overall picture of the course? Which parts of a current homework assignment would be done better if students had practice and help applying its concepts? Are there any in-class learning activities that are being rushed for lack of time during class? What kinds of practice do students need in order to successfully complete larger assignments on their own? Will students be able to make connections between the in-class activities and the larger assignment? Step 5: Plan ways to extend the active learning experience beyond the classroom, either through individual work or additional collaborations. 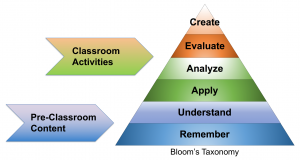 Think about how students’ new knowledge and skills from a “flipped” class can play into the larger design of the course – are they building on new concepts with each subsequent class, are they working on the pieces of a larger project, etc.? These questions become especially important since students may think they have gained mastery with the in-class work alone, which is rarely enough to meet all learning outcomes.